The chief knock on it? That it’s downbeat and depressing. How shocking — given that it’s based on Cormac McCarthy’s Pulitzer Prize-winning novel about a father and son trying to survive a world-killing nuclear winter. I guess those critics were looking for a more cheerful post-apocalyptic tale. In fact, Hillcoat’s film is both faithful to and expands upon McCarthy’s novel. But as the book did, it always returns to the father, played with fierce tenderness by Viggo Mortensen, and his efforts to keep his boy alive and get him to some safe place — if such a place still exists. 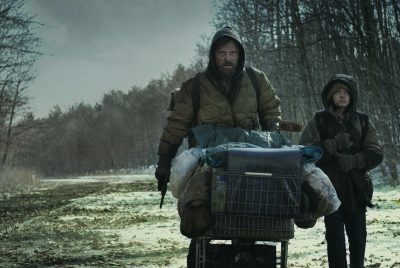 It’s a performance that alternately smolders and flares, as Mortensen and Kodi Smit-McPhee (as the boy) trudge through a gray, desolate landscape, trying to maintain their humanity and stay alive, while dodging others who have succumbed to the Darwinian imperative. It’s an important and a genuinely moving film, one that deserves a wide audience. Here’s hoping that it finds one in the crowded award season of November, when it will be released. I must confess that I am dreading the film as much as I look forward to it. I’m depressed enough already! McCarthy’s The Road has been sitting on my shelf for over a year, waiting for me to build up the courage to read it. But with Viggo in the film, I’ll be in the theater as soon as it reaches my hometown, and I have no doubt I’ll be glad I saw it. You can read the rest of Marshall Fine’s Toronto reviews at his site, Hollywood & Fine.